Fremont, CA (June 28, 2017) — ASUS is excited to launch the XG-C100C, an all-new affordable network adapter designed to enable ultra-fast 10Gbps network access for desktop PCs, so you can easily handle the most data-intensive workloads in your office or at home. The ASUS XG-C100C uses next-generation 10GBase-T (10G) networking technology to deliver speeds of up to 10Gbps –10X faster than standard gigabit Ethernet. XG-C100C supports 10/5/2.5/1Gbps and 100Mbps networking standards, so it’s designed to provide you with the latest Ethernet technology, while ensuring full backward compatibility with your existing network infrastructure. XG-C100C has a standard RJ45 LAN port so you can easily upgrade to 10Gbps networking using standard, readily available copper network cables, avoiding the need to install costly optical fiber cables. Plus, full compatibility with Windows versions 7, 8.1 and 10 plus Linux Kernel 4.4 allows a wide range of OS choices. In addition, built-in Quality-of-Service (QoS) technology automatically prioritizes bandwidth for gaming, ensuring a smooth, latency-free gaming experience. The ASUS XG-C100C is available now at leading resellers in North America with suggested MSRP pricing of $99. For additional information on the XG-C100C and the complete line up of networking products, please visit - ASUS North America. CAMARILLO, CALIF., June 27, 2017 (MEDIAWIRE) – Orca Design and Manufacturing, exclusive U.S. distributor for Focal car audio products, recently began shipping the brand's first digital signal processor designed for OEM integration applications. The FSP-8 interfaces with factory or aftermarket source units to add power amplifiers and fine-tune the audio environment. First introduced at the 2017 Consumer Electronics Show, the eight-channel digital signal processor is now available to Focal retailers throughout North America. "OEM integration is the accepted direction of the car audio market today," said Nalaka Adikari, national sales manager for Orca. "Even the best amplifiers and speakers need an interface to take factory signals and manipulate them to get the best possible audio output from the system. For car audio technicians this summer selling season, the FSP-8's versatility, expandability and no-compromise performance will give even the most critical audiophile the ability to enjoy premium sound from a factory source unit." The FSP-8 has six input channels that can be connected to low-level or speaker-level outputs. The output stage features eight 3.4-volt preamplifier connections to accommodate a variety of sound system configurations. For factory systems without auxiliary inputs, the FSP-8 includes a pair of stereo RCA inputs as well as a 24-bit, 192kHz optical input for digital sources. During installation, the FSP-8 is configured through a laptop connection via USB, and the FSP-8 DSP Manager software suite. The technician can select frequency ranges for each output pair, adjust time alignment, set frequency curves and more. For end users, the included wired LCD remote enables selection of auxiliary inputs and up to four audio setting presets as well as volume control. Suggested retail price for the FSP-8 is $999.99. For more information, visit focal-america.com. We just launched Touch, the second generation to our world's smallest wireless earbuds now featuring Bluetooth 5.0 technology. Forget Apple Airpods, these are smaller and more affordable. 1.) Never drop bluetooth connection. Touch will now feature Bluetooth 5.0 - We’re one of the first to feature this game-changing technology. 4 times longer range, instant pairing and 2 times faster speed than even the latest Bluetooth 4.2. This means an extremely stable headset that never drops. Read about the details on the official Bluetooth.com website, and watch this video that’s getting the tech community extremely excited. 2.) Touch sensor technology with Artificial Intelligence - Touch features a buttonless design. We removed the button to create a stunningly beautiful shape and integrated a touch sensor to allow you to connect to your favorite AI platforms such as SIRI, Google and Cortana. 3.) World's Smallest - Designed with minimalism in mind and to virtually disappear in your ear, it’s still the world’s smallest. Not interested in the obtrusive look of other earbuds like the Apple AirPods? Touch’s one-of-a-kind design is the most beautiful looking headset on the market. Visit the campaign page to see the differences. 4.) Ergonomic Stay Fit - We added a slight angle to the earbud to naturally fit the curvature of the human ear. It'll stay in your ear while exercising and throughout the day. Perfectly fit for the millions of people in the world. Indianapolis, Ind. (June 20, 2017) – Klipsch Audio, a tech-driven audio company, today announced an exclusive relationship to bring premium, concert-level sound to MasterCraft Boat Company’s new sport boats. The first-ever Klipsch marine speakers and amplification solutions are exclusively offered on MasterCraft boats. Heralded in the music industry for its pioneering achievements and the power of its audio systems, new Klipsch Audio systems now create a heavy-hitting, customizable concert-style entertainment experience on a MasterCraft. Klipsch Audio brings over 70 years of expertise to the water to debut premium, custom engineered marine audio systems exclusively for MasterCraft. New Klipsch speakers are simply, louder. Working with Klipsch amplification systems, they use less power while adding more volume with minimal distortion - even at peak levels. Beyond its sheer power (up to 120 dB), the new sound system is tuned for a rich, accurate sound across a broad frequency range. It doesn’t exaggerate any part of the music. The new Klipsch speakers are marine-specific - from controlled directivity to being protected from the elements. “We are excited to bring the power, detail, and emotion of the live music experience that only Klipsch speakers deliver to the world of boating with our strategic partner Mastercraft. Klipsch speakers have stood the test of time and we are thrilled to bring this unparalleled audio experience to MasterCraft consumers,” said Oscar Bernardo, Chief Operating Officer for Klipsch Group, Inc.
MasterCraft partnered with Bongiovi Acoustics to implement its Digital Power Station™ (DSP) technology to customize the new Klipsch-powered system specifically into MasterCraft’s boats. The Bongiovi DSP contains a unique, patented digital audio signal processor that adjusts real time to music to ensure concert level sound - another first for the marine industry. The Bongiovi DSP module is tunable, changing the sound of the system depending on which software mode is selected by the driver. With three modes to choose from - drive, tow and chill – drivers can have customized sound to every MasterCraft boat while under operation. The new Klipsch Audio systems will remain an exclusive to MasterCraft through at least October, 2020 through an agreement with ASA Electronics, a leading designer, manufacturer and distributor of mobile electronic products. Klipsch Audio systems will debut on new 2018 MasterCraft boats. Customers can place orders effective immediately. To learn more about MasterCraft’s new Klipsch Audio systems, please visit: www.mastercraft.com. For more information about Klipsch speakers, visit www.klipsch.com. Headquartered in Vonore, Tenn., MCBC Holdings, Inc. (NASDAQ: MCFT) is the parent of MasterCraft Boat Company, a world-renowned innovator, designer, manufacturer, and marketer of premium performance sport boats. Founded in 1968, MasterCraft has cultivated its iconic brand image through a rich history of industry-leading innovation, and more than four decades after the original MasterCraft made its debut the company’s goal remains the same - to continue building the world’s best ski, wakeboard, wakesurf and luxury performance powerboats. For more information, visit www.mastercraft.com. IRVINE, (Calif.) – Razer™, the leading global lifestyle brand for gamers, today announced its upgraded 13.3-inch version of the award-winning 12.5-inch Razer Blade Stealth. The new Razer Blade Stealth is one of the most portable laptops for professionals in the world, measuring 0.52 inches thin, weighing 2.93 pounds and with up to nine hours of battery life. Razer’s latest chassis is CNC-milled out of aircraft grade aluminum, and it is now available in a black or gunmetal gray finish. The gunmetal gray variant features a tone-on-tone Razer logo and white backlit keyboard, offering a sleek, solid and professional design. Gunmetal gray will be available in the United States and Canada. A new 13.3-inch Quad HD+ (3200 x 1800) IGZO touch-enabled display with 100 percent sRGB color space comes standard on the new Razer Blade Stealth. The larger display enhances the Blade Stealth’s visual appearance with a 50 percent thinner bezel compared to the previous version without increasing the size of the laptop. Wide viewing angles up to 178 degrees, with high-color saturation, display content with striking clarity and accuracy. Razer will continue to provide the Blade Stealth 12.5-inch 4K model with 100 percent Adobe RGB color saturation for the most demanding visual tasks. The new system continues to stand in a class of its own for portable production. The 13.3-inch Blade Stealth with Windows 10 comes standard with a 7th generation Intel® Core™ i7 processor for ultimate performance and 16GB of fast, dual-channel memory with up to 1TB of PCIe solid-state storage for productivity enhancing performance. The black version of the Razer Blade Stealth remains one of the only laptops in the world equipped with an individually backlit multi-color laptop keyboard. Powered by Razer Chroma™, personalization is easy as users can customize their lighting effects and choose from 16.8 million color options. For those gamers who want a mobile laptop during the day and a desktop-class gaming system after hours, the Blade Stealth easily connects with the optional Razer Core to deliver external desktop graphics power and expanded connectivity options via a single Thunderbolt™ 3 cable. Razer Core provides a true plug-and-play external graphics enclosure solution that does not require a reboot of the system every time a user connects. The Razer Core is also compatible with many of the latest desktop graphics cards from both NVIDIA® and AMD®. It is now easier than ever to transform a thin and light laptop computer into a desktop system experience. The Razer Blade Stealth has earned more than 30 awards since its first launch in 2016, including “Best of CES – ‘Best PC’” and ‘People’s Choice’” and PC Mag “Editor’s Choice,” and continues to be critically acclaimed worldwide as one of the best choices for mobile professionals. The new Razer Blade Stealth 13-inch version will start at $1399 and is equipped standard with 16GB of RAM and an Intel Core i7 processor. It is shipping today from RazerStore.com and will be available at Best Buy, Microsoft Store, and Amazon nationwide later this month. The Razer Core is available for $399 with purchase of the Razer Blade Stealth or Razer Blade laptop and $499 standalone. For more information, visit razerzone.com/blade-stealth. For more information visit http://www.razerzone.com/about-razer. beyerdynamic, Inc. presents the new version of the TG 1000 digital wireless system at InfoComm 2017 June 14-16 in Orlando, FL Audio Pavilion, Booth 5775. This 24-bit system now has a Dante interface and can be integrated seamlessly into digital audio networks based on the popular Audinate solution. The TG 1000 dual receiver is equipped with a Dante network interface in the form of an RJ45 connector flanked by status LEDs on the back of the 19" device (1 HU). The dual receiver's analogue audio output also comes with a modern digital option - perfect connectivity guaranteed without inconvenient interfaces! The Dante network solution from the Australian company, Audinate, is extremely popular in all professional audio applications. In recent years, it has established itself worldwide at live events, studios, and in fixed installations. Dante transfers uncompressed digital audio data via standard IP networks; thus, interference-prone, inconvenient multi core copper cables are replaced with cost-effective Ethernet connections. With the help of clearly designed software, even complex networks can be configured with just a few clicks of the mouse. Dante is supported by numerous pro audio manufacturers and allows for effortless multi-channel signal exchange, with negligible latency, between hundreds of pro audio products available on the market. Alan Feckanin, Director Americas, states "The TG 1000 wireless microphone produces high quality sound and can now be integrated into any digital sound system because of the Dante digital interface. This microphone is perfect for many uses, including house of worship and conference room settings. The markets we sell to will be well served by our new capabilities with the TG 1000." The beyerdynamic TG 1000 wireless system has an impressive switching bandwidth of 319 MHz in the UHF range (470 - 789 MHz), guaranteeing long-term investment security and smooth operation across the globe. Operation is extremely intuitive thanks to the high-contrast OLED display, one button navigation and Chameleon software. When it comes to sound, the TG 1000 system knows how to impress - with outstanding dynamic range and optimal sound transparency. Up to six dual receivers can be cascaded without the need for external antenna splitters. The total latency from transmitter to receiver is only 2.1 milliseconds. In optimal environmental conditions, the transition range can reach up to 984 feet. In a business environment, optional proprietary encryption ensures that sensitive information remains confidential. The TG 1000 system components bear the "Made in Germany" quality seal, are made with a high level of expertise in Heilbronn, Germany using only robust, high-quality materials. There is a comprehensive assortment of capsules available for the TG 1000 handheld transmitter that, in addition to dynamic variants and first-class condenser capsules, also includes the legendary beyerdynamic TG V90w ribbon module. The TG MM1w interchangeable capsule can be used in combination with the TG 1000 handheld transmitter to calibrate public address systems in theatres, at live concerts and at festivals. Lavalier, neck worn and ear hook microphones are available for use with the TG 1000 belt pack transmitter, and discerning instrumentalists appreciate the beyerdynamic Touring Gear instrument microphones. The ergonomically designed TG 1000 transmitters, which can be synchronised using the FastSync function in less than a second, facilitate around eight hours of constant use; the transmission performance can be switched between 10 mW and 50 mW. 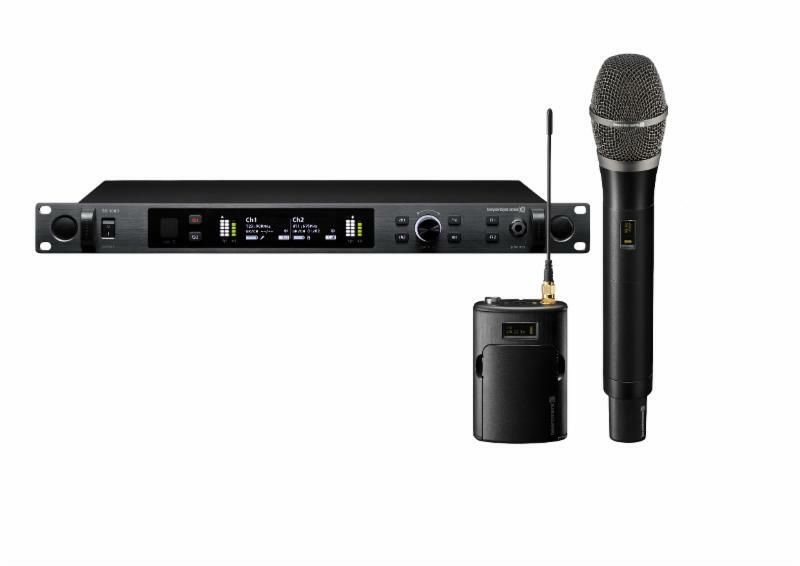 An extensive range of accessories, from an intelligent charger with network connection to flexible antenna management, completes the offer and transforms the beyerdynamic TG 1000 wireless system into a perfect, painstakingly designed solution for every application - and now, thanks to the Dante interface, it can be part of the complete digital workflow of modern audio networks. Dante™ is a trademark of Audinate Pty Ltd.
Audinate® is a registered trademark of Audinate Pty Ltd.
Two business divisions - audio systems and headphones - provide tailored solutions for professional and private users. All products are developed in Germany and primarily manufactured by hand - from hi-fi headphones to stage microphones and conference and interpretation systems. beyerdynamic, Inc. is a branch office based in Farmingdale, NY, which serves as a distribution office for the whole North American region. For more information, please visit www.beyerdynamic.com.